Why Should You Install a Home Awning? Installing a home awning is one of the best ways to increase your home’s value! If you’re looking at making home improvements that have the biggest payoffs, there are a few different options. Many people look at doing remodeling projects inside or doing regular landscaping on the outside. However, realtors all over the country will tell you that the best way to add to your home value is through increasing the curb appeal of your home. Adding a home awning can pay off in more ways than one! Window and door awnings give your home more curb appeal by combining form and function to give you, your family, and your guests protection from the sun and rain. When you decide to install a home awning, the contractor works with you and your home to determine how the awning will match the home and personal preferences of the homeowner. 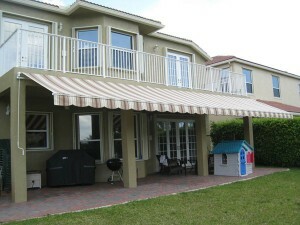 Awnings can come in nearly limitless design options, from the form of the awning and the fabric to the choice of color. They look great year-round and can withstand the effects of weather with a little bit of maintenance. Some homeowners might balk at potential upgrades to their home because of the cost. For example, the average cost of a major kitchen remodeling project is around $20,000. Even though kitchen remodels have a good return on investment, that’s a pretty steep initial outlay to get that return! Home awnings, on the other hand, are very affordable and can even pay for themselves over time. In addition to the boost in your home value, a home awning can reduce your energy usage and save you money on your utilities. Studies have shown that fabric awnings on windows facing south reduced heat gain in the home by over 50% and having the awnings face west increased this reduction to 75%! And since heating/cooling expenses account for around half of the average home’s utility expenses, there is real potential for home awnings to save you some money in addition to adding to your home value.